Dammam is an iconic landmark of the Saudi Arabia Kingdom. With its countless tourist attractions and historical sightseeing’s, Dammam has become one of the fastest growing destinations in the Middle East. If you're searching for Dammam flights, we at Rehlat offer cheapest flights to Dammam with best price guarantee. Save more with the exclusive Dammam flight discounts on major airlines and also be eligible for cashback coupons. Being the capital of the Eastern Province, Dammam is one of the most beautiful cities in the Kingdom of Saudi Arabia. Located on the Persian Gulf, Dammam has some of the wonderful landmarks like Marjan Island, Al Hayat Plaza, King Fahd fountain, Half Moon Beach, the Coastal Sports Center. Saudi's third largest city Dammam is renowned for its several man made historical sites and ancient forts. It is home for varied number of historical attractions including the Heritage Village, National Museum, Dammam Corniche and Makkah Gate. The historical city welcomes several million visitors every year from all regions of the Middle East. Dammam is a primary hub for shoppers, where you can find various local markets, shopping malls, oldest markets and souks. The city is filled with best shopping places like Al Qadisiyah, Mohammed Ibn Saud, Al Anud, Al Mazruiyah and much more. Dammam is one of the world's most fascinating dinning destinations. The city offers unparalleled multicultural cuisines like kabsa, Margoog, Jereesh, Gursan, Mahela and much more. Check out some of the best restaurants in Dammam including Masala House, Asahi Pan-Asian Restaurant, Heritage Village, Ghazi Restaurant Dammam and Lyalina Restaurant. The local transportation in Dammam consists of different modes including train, public bus, taxi and car to move around the city. Taxi and cab services are available 24/7 at an affordable cost. King Fahd International Airport is the third busiest airport in the Saudi Kingdom that serves domestic and international flights in the Middle East, Asia and Europe. 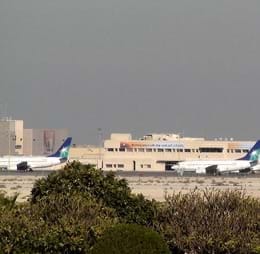 It is the primary hub for Saudia Airlines, Aramco Aviation and SaudiGulf Airlines. The passenger terminal is used for domestic and international operations. It is well equipped with gift shops, restaurants, tourist desk, car rental counter, ATM's, VIP lounge and much more. King Fahd International Airport is well connected by various modes of public transportation including buses, taxi and cars. Taxi and cab service counters are available outside the airport arrivals.